By now you’re probably familiar with who your general dentist is. 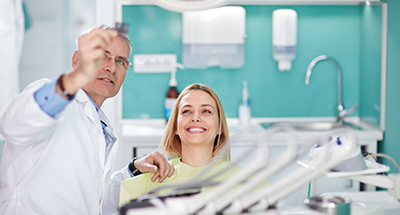 As your go-to provider, your general dentist manages your oral health and takes care of most your dental needs, which may include: dental exams, preventive care, fillings, crowns, veneers, bridges and root canals. But what about specialists? Who are they and what do they do exactly? A specialist is a general dentist who has completed additional post-graduate training. By completing extensive training in their chosen area, they focus primarily on performing these specific procedures. Types of specialists include: Endodontists, pediatric specialists, prosthodontists, oral surgeons, periodontists and orthodontists. Your general dentist can, in most cases, perform most of the same procedures a specialist performs. Depending on both the patient and dentist, this encompasses a wide-range of services – most anything from extracting teeth to cosmetic and restorative procedures. However, there may be a time that your general dentist will refer you to a specialist. The reason could be the complexity of a procedure, the patient’s health, or because you feel your procedure warrants a provider with extra, specialized training. Whatever the case may be, we recommend consulting with your general dentist first, and then if necessary, your referred specialist. If you choose to see a specialist on your Dental Select plan, benefits can vary according to your plan. Reimbursement on our end will take place after your deductible is met, and we have agreed to pay according the contracted fee schedule. Before scheduling your appointment, we recommend talking to a Customer Care representative first. That way, you can be aware of what is covered prior to procedure. Pediatric Specialists: Pediatric dentists complete four years of dental school and two additional years of residency training in dentistry for infants, children, teens and children with special needs. These dentists deal particularly with the oral healthcare of children and take care to make young patients feel welcomed and comfortable. In many cases, pediatric dentists often work closely with pediatricians providing comprehensive medical and dental care. Pediatric dentists can find and treat problems relating to tooth decay and missing or crooked teeth. Orthodontists: An Orthodontist is a dentist that has completed four years of dental school and two to three years of residency training accredited by the ADA of Advanced Education in Orthodontics. Orthodontists specialize in the development, prevention, and correction of irregularities of the teeth, bite, and jaws, as well as facial abnormalities and disorders of the jaw. An orthodontist straightens teeth and bites with the use of braces, wires, bands, as well as corrective appliances or retainers. Oral Surgeons: Oral and maxillofacial surgeons are dentists who have completed at least four years of post-graduate surgical hospital residency. These dental surgeons are trained to treat and diagnose defects, injuries and diseases of the mouth, jaw, teeth, neck, gums, and other soft tissues of the head. Oral surgeons commonly deal with wisdom teeth removals, facial pain, TMJ, dental implants and removal of tumors and cysts as well as reconstructive surgery for trauma or aesthetic reasons. Endodontists: This particular branch of dentistry is concerned with the dental pulp, the soft tissue between the tooth’s outer enamel and the dentin. An endodontist has specific training in performing root canal therapy, therefore, this specialist can perform difficult root canal treatments and other root procedures. Periodontists: Periodontics encompasses the prevention, diagnosis and treatment of diseases of the supporting and surrounding tissues of the teeth, their function, aesthetics and healthy maintenance. Periodontists treat and diagnose gingivitis and periodontitis. They may also perform deep pocket cleanings, root planing, implant placement, crown lengthening procedures, soft tissue procedures or hard tissue recontouring.